We have been balancing working on the boat and spending quality time with our Grand Daughter and with trying to avoid sitting in going nowhere traffic at 5pm each day. So progress is not as fast as originally planned, but then I'm always the optimistic. Today's big project was getting the Rudder re-installed, it went well but with a minor delay. The marina team re-positioned the boat stands before we got down to the boat today around 10:45, so we quickly set to work sanding the bare patches previously covered by the stands, ground out the blisters we found and washed them out. We'll let them dry out overnight and apply resin tomorrow. Around 1:30 today, the Marina crew stopped by and asked if we could be ready to re-install the rudder early, like in the next 20mins! I was confident that we had everything ready, even if we had just painted the parts of the rudder that would be difficult to reach once the rudder was back in place. We quickly cleared up our tool bags and boxes around the boat so that the boat lift could surround our boat. I moved the truck out of the way and just as promised, they arrived to pick the boat up. Plan was to raise the boat high enough in order to get the rudder post inserted into the rudder post tube in the bottom of the boat. As it would be inserted, they would have to pause to allow me to put the Steering quadrant over the rudder post inside the boat before the rudder was fully inserted. That went perfectly to plan! then, as quickly as they arrived and put the straps around the boat's belly to lift her up, they lowered her back down and re-positioned the boat stands before removing the straps and driving the crane away. Then I realized that I had not put the Rudder Post Stuffing cap onto the post prior to the Steering quadrant! Dang!!!! Solution? I lowered the rudder to the ground, that left enough gap at the top of the rudder post to remove the steering quadrant and install the rudder post stuffing cap. Deep Breath! 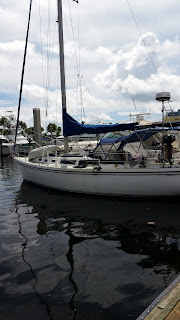 all is ok.
Having fixed that little issue, I set about reconnecting the steering cables to the steering quadrant and securing the Emergency Tiller Cap at the top of the rudder post which actually stops the rudder falling out of the boat. Well! Nearly! It seems that the Turnpike and I95 both get blocked every day around 4:30, patience ruled the day and we made it home safely. Time for a Shower, Dinner and a glass of wine! See you on the water - next week!